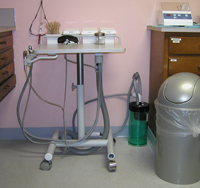 With The Amalgam Collector™ installed, during usage of the office vacuum system, all components brought from the operatories through the vacuum line plumbing enter into the canister and remain there. Only air passes on through. 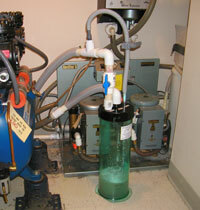 If no further intervention occurs the canister will continue to collect materials until it fills up to the height of the outgoing air connector inserted through the lid. At this time the materials in the canister near the top will be drawn out of the unit and continue through the system just as they previously used to do prior to the installation of The Amalgam Collector™. This phenomenon is the built-in safety overflow feature of the unit that will function in the event that the regular maintenance is neglected. For best results, we recommend that the collected materials in The Amalgam Collector™ be allowed to stand for at least 8 hours undisturbed either by movement of the canister or by the stirring action of the active vacuum system. 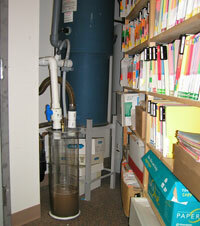 This allows the maximum amount of sedimentation to take place. After the quiescent period, the supernatant liquid is drawn off with minimal disturbance of the sedimentation layer. For the manual valve models, the air out valve is closed and the liquid out valve is opened to decant the liquid. This allows room for the next batch of waste water to be collected. We recommend that the valve setting for evacuation be done immediately after shutting off the vacuum system for the day or weekend so that the liquid is drawn off immediately when the vacuum system is reactivated the next working day. This minimizes the chances of accidentally stirring by someone prematurely activating the vacuum system not realizing or remembering that the liquid needs drawn off. In addition to the overflow safety feature noted above, The Amalgam Collector™ is designed to allow proper function of the vacuum system even if the proper resetting of the valves is inadvertently overlooked for a period of time. Thank You For Helping Keep Our Environment Clean! Back To Top | Contact Us Copyright © R & D Services Inc. All rights reserved.